Republic, 12 Chapters, 1953. Starring Bill Henry, Susan Morrow, Dale Van Sickel, Arthur Space, Mike Ragan. Marlof (Arthur Space), the agent of an unnamed foreign power, has been assigned to build hidden rocket-launching platforms in the Canadian wilds–which are to be used to blast major American cities with atomic missiles, in preparation for his country’s imminent full-scale invasion of the United States. 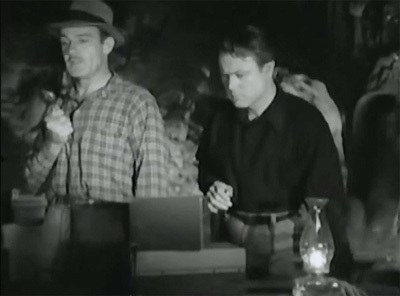 Marlof assigns his two henchmen, Beck and Reed (Dale Van Sickel and Mike Ragan) to keep settlers away from the planned platform sites in the remote Taniak area, but the duo’s efforts in this department–and their attempts to procure the supplies needed for constructing the platforms–are continually interfered with by Mountie sergeant Don Roberts (Bill Henry) and Canadian government agent Kay Conway (Susan Morrow), who are determined to track down Marlof’s spy ring. Although Don and Kay are unaware of Marlof’s master plan–and are also unaware that Marlof is spying on them in the guise of half-witted trapper Smoky Joe–they manage to stop his sinister construction project before he and his cohorts can even get it started. 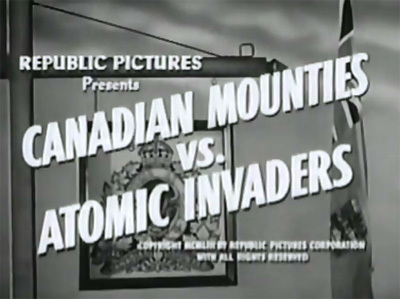 Canadian Mounties vs. Atomic Invaders makes effective use of an interesting assortment of stock footage, while its new footage is more than adequate; it also features a good cast and some nice location shooting. However, the serial ultimately comes off as unexciting–and even unintentionally comic at times–due to its combination of a low budget with a central premise that is far too grandiose for said budget. Even by the fantastic standards of the serial genre, Ronald Davidson’s screenplay for Invaders is patently unbelievable. In the chapterplay realm, it is possible to accept the idea that a “foreign power” (obviously supposed to be the Soviet Union) would rely on hidden missile bases located inside a powerful anti-Soviet nation to support a ground invasion of the US–even though the scheme seems rather militarily risky. However, it’s simply too hard to swallow the idea of this delicate and vital operation being delegated to a single agent–who in turn can only afford to hire a grand total of two thugs to assist him. 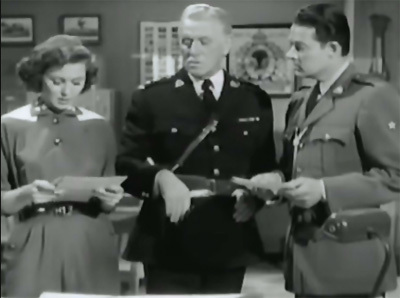 Henchman Beck even tells Marlof in Chapter Four that “this job is too big for two men to handle,” but his plea for more assistance is denied–due, of course, to the budgetary restrictions common to all of Republic’s late serials. Had the heavies been engaged in a less ambitious Cold-War espionage venture–mining uranium in the Canadian wilds and smuggling it out, for example–the smallness of their outfit would have seemed far less incongruous. Above: Marlof and his overworked lieutenants lay their plans. Marlof’s gang is not only undermanned; it also fails so often as to seem either inept or hoplessly unlucky. First, Beck and Reed’s inability to keep a party of settlers out of the future missible-base territory (their attempts to do so occupy the serial’s first four chapters) forces Marlof to frustratedly relocate the base site to a region that’s dangerously close to the Mountie post. Then, the two henchmen spend the better part of three episodes unambitiously skirmishing with Sgt. Roberts as they look for a secure hideout and try to obtain food supplies. In Chapter Eight, the pair finally starts trying to procure the material needed to build the missile-launching platforms–but are so thoroughly hampered in these efforts that, by Chapter Eleven, Marloff has grudgingly decided to settle for a single platform. This platform never even gets built; the Mounties swoop down on the spies as they start laying the groundwork in the final chapter. The contrast between the grandeur of the villains’ plans and their pathetic success rate winds up making Marlof seem a doomed and delusional fool who’s bitten off far more than he chew, not “the most dangerous man in Canada” that the Mountie commissioner calls him in Chapter Twelve. Above: The Mounties attack the embryonic missile base in the final chapter, setting the seal on the villains’ sorry career. As the above outline of the plot indicates, Atomic Invaders’ narrative is decidedly repetitious, although this is the least of the screenplay’s faults; as in most other late Republic serials, the thirteen-minute episodes go by so fast as to make the repetition less noticeable. 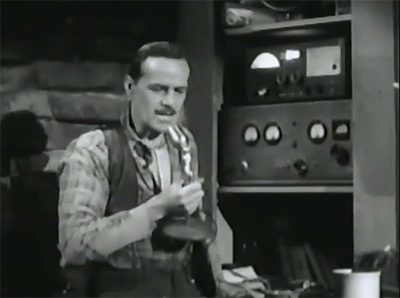 This is true even in the serial’s first third, which has the hero, the heroine, and a party of settlers encountering a set of perils culled from the 1938 Republic feature Call of the Yukon–which was partly filmed on location in Alaska. 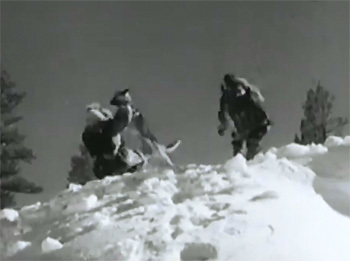 The use of this stock–like the deployment of similar frozen-north footage in Universal’s The Great Alaskan Mystery–has often been criticized by buffs, but I find it more of an asset to the serial than a detriment, allowing as it does for some comparatively unique action scenes. The jerkier filming speed of some of the old footage and the switches between genuine Alaskan scenery and snow-strewn studio interiors are sometimes jarring, but for the most part Republic’s ever-skillful editors do a very acceptable job of splicing the Yukon sequences into the serial. Above left: A wild dog attacks a settler in a borrowed Call of the Yukon shot (left). Above right: another vicious canine grapples with Bill Henry as Dale Van Sickel watches in new footage. 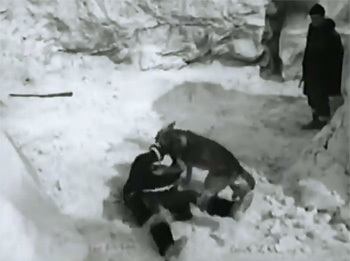 Among the aforementioned pieces of unique Yukon-derived action are the ferocious wild-dog attack on the settlers and their stock of reindeer in Chapter Three (which manages to be quite exciting despite its heavy reliance on stock footage), the entertaining dogsled chase in Chapter Four, and the breakup of the frozen river in Chapter Five (which, unfortunately, features the most noticeable continuity error seen in the old-new footage sequences: our hero claims he’s cutting the dogs loose from the sled, but we can see the still-harnessed pooches swimming to safety–with sled in tow–in long shots). The spectacular Chapter One avalanche sequence that serves as the serial’s initial cliffhanger is quite good too–although the devastation wreaked in the borrowed footage makes it hard to belive that the protagonists could have survived it (as they nevertheless do in the new footage). Another piece of stock from Call of the Yukon–a comic scene in which two bear cubs wreck a trapper’s cabin–is far less interesting, although it leads to an amusing punchline (this bit is, thankfully, the only real piece of pointless filler in the serial). 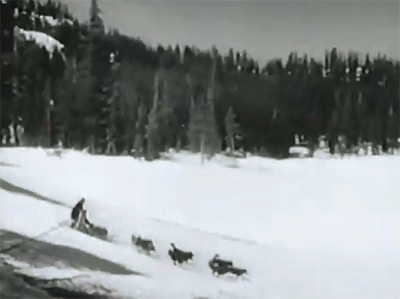 Above: A shot from the dogsled chase scene (originally from Call of the Yukon). 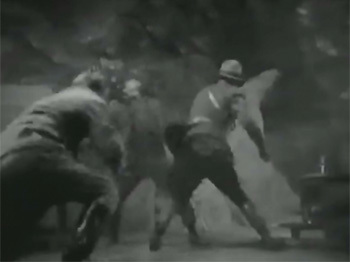 Once the characters leave the frozen Taniak country behind (midway through Chapter Five), Republic’s more familiar Mountie-serial footage comes into play; car, boat, and horseback chases from King of the Royal Mounted and King of the Mounties supply most of the chapter endings in these episodes, along with a few pieces of in-chapter action like the truck-horse chase and the ensuing fight in Chapter Eight. Among the borrowed cliffhanger scenes are the the boat wrecks that close Chapters Six and Nine, the car-truck collision that finishes Chapter Eight, and the cliff falls at the ends of Chapters Seven and Eleven. The serial’s few original cliffhanger scenes are small-scale but well-handled–particularly the pitfall in Chapter Two, the hero’s apparent mangling by a vicious dog at the end of Chapter Three, and the cleverly-devised bear-trap cliffhanger in Chapter Ten. 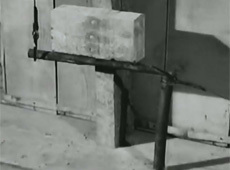 Above: Bill Henry is caught in a bear trap and tugs on its chain (left), unaware that by doing so he’s pulling out a prop (center) and bringing a spiked deadfall down on himself (right). 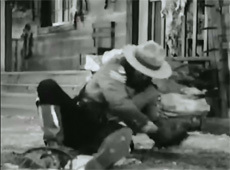 The new in-chapter action footage is also well-handled; among the highlights are the whip fight between Bill Henry and Dale Van Sickel, the fight between Henry and Mike Ragan on the cabin porch in Chapter Four, the cave shootout later in the same episode, the Chapter Five car chase, the fight at the boat dock in Chapter Nine, the shootout in the forest in Chapter Eleven, and the climactic fight/shootout at the cave in Chapter Twelve. 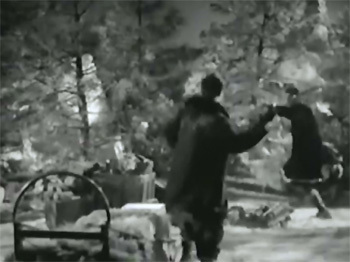 Ragan and Van Sickel double themselves in the fistfight sequences; Tom Steele can be seen standing in for Henry in the first-chapter restaurant fight, but the leading man also handles many brawls himself (a common practice during Republic’s low-budget last days). Franklin Adreon, who began at Republic as a screenwriter in the 1930s and became the studio’s serial producer in the late 1940s, handles both action and dialogue scenes quite serviceably in his first directorial assignment (thrust on him after the unexpected death of Fred C. Brannon). Above: Shots from the whip-fight scene (left) and the climactic cave fight (right). During the Taniak sequences, new scenes are either shot indoors (against painted backdrops or process screens) or on the Republic backlot, which is sprinkled with a white substance of some sort that makes it look properly icy. 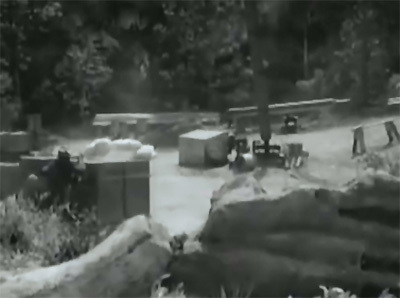 Republic’s backlot is also seen in some of the non-Taniak outdoor sequences in the later episodes–but the majority of these scenes were shot in the Big Bear Lake region within the San Bernardino National Forest. The Big Bear area, of course, can be seen in virtually every Mountie serial–but for a very good reason; here, as elsewhere, its towering pine forests and hilly roads make a convincing and attractive screen representation of the Canadian wilds. 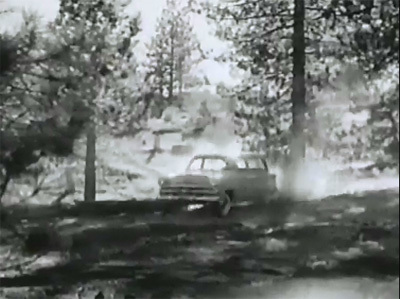 Above: The hero’s car in pursuit of the villains in the Big Bear Valley’s forest. 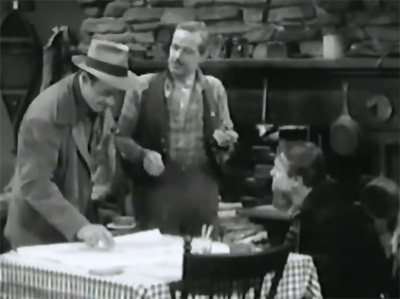 Star Bill Henry–a seasoned and versatile performer who played everything from juveniles to heavies, in both A and B films–does a solid and likable job in his only serial role, easily switching back and forth between forcefulness and cheerfulness (his first-chapter confrontation with Mike Ragan provides one good example of this). Susan Morrow–a former leading lady to stars like John Payne and Charlton Heston in some A-features for Paramount’s Pine-Thomas affiliate– makes an attractive heroine, coming off as intelligent and calmly capable, although she’s never as spirited as she was in her features and in several later television appearances. 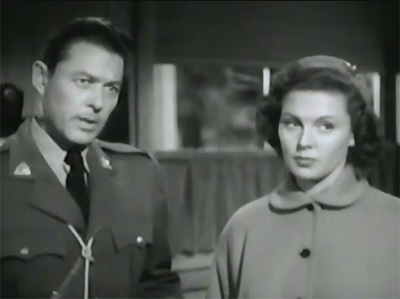 Above: Bill Henry and Susan Morrow. As the leading action heavy, Dale Van Sickel shows himself to be a good actor as well as a great stuntman; he delivers his lines with assurance and manages to seem more than crafty enough to believably orchestrate villainous strategies on his own. The hulking and perpetually scowling Mike Ragan (who formerly acted under the name of Holly Bane) is effectively nasty as Van Sickel’s bad-tempered partner in crime. Above: Dale Van Sickel (left) and Mike Ragan. Arthur Space, who turned in excellent brains-heavy characterizations in several later Republic B-westerns, is badly miscast as Marlof; while the actor excelled at playing slick and jovially cynical Old West profiteers, he’s simply not grim or threatening enough for the part of a humorlessly fanatical Russian agent. His repeated rants about his country’s urgent need for the launching platforms come off as petulant instead of sinister, while his character’s undercover pose as the cranky half-wit “Smoky Joe” doesn’t allow him to display any of the hypocritical but convincing affability that marked his B-western turns (although his mumbling and grumbling as “Joe” is amusingly eccentric). Of course, the scripting weaknesses mentioned above don’t do Space any favors; it’s worth noting that he’s quite good in his first scene–during which he whips off his Smoky Joe makeup and begins smoothly and confidently issuing orders to his two henchmen; even a more naturally intimidating actor would have had a hard time preserving this aura of confidence in the face of the setbacks that the writers inflict on Marlof. Above: Arthur Space as the harried Marlof. Pierre Watkin is his usual briskly authoritative self in his occasional scenes as a RCMP Commissioner, while old-timers Edmund Cobb and Stanley Andrews make welcome appearances as settlers. Hank Patterson does an amusing turn as an old trapper, and Harry Lauter makes the most of a last-chapter bit as a Mountie (delivering his scant dialogue in entertainingly wry fashion). 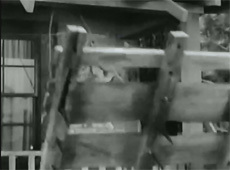 Fred Graham is good as a crooked and blustering guide in the first two chapters, while his fellow stuntman Tom Steele makes a single appearance as a truck-driving henchman; stuntmen Carey Loftin, Joe Yrigoyen, and George DeNormand also have one-chapter bits–the first two as thugs, the third as an alert boatman. Gayle Kellogg is a subordinate Mountie, Jeanne Wood and Jean Wright play the wives of Andrews’ and Cobb’s characters, and William Fawcett–in his only Republic serial–has a walk-on as another old trapper. Canadian Mounties vs. Atomic Invaders is watchable, but too ill-conceived in the plotting department to be very satisfying. Despite respectable efforts on the part of the director, the actors, and the editors, it’s just difficult for a viewer to become particularly involved in Sgt. Roberts’ fight against the embarrassingly non-threatening “Invaders” of the title. Above: Pierre Watkin and Bill Henry watch as Susan Morrow comments that “It’s fantastic how so few men could expect to destroy two countries as powerful as the United States and Canada.” You’re so right, ma’am. This entry was tagged Edmund Cobb, Franklin Adreon, Hank Patterson, Harry Lauter, Pierre Watkin, Republic serials, William Fawcett. Bookmark the permalink. I’m mostly in agreement with your review.